Soccer By Ives is a fantastic soccer blog that I visit daily. They have a top 5 goals of the year for the red, white and blue up, and it’s a good read for any fan. I enjoyed Charlie Davies’ goal against Mexico, but that’s mainly because I watched that match in New York City at Nevada Smith’s with hundreds of other fans. Get well soon, No. 9. I recorded a USA chant on my blackberry, and I still listen to it every once in a while. But, as much as I love SBI, I think Jonathan Bornstein’s header against Costa Rica should have made the list. I just got goose bumps. Again. Even though their fans are annoying and delusional, I’m about to lay out a simple plan to fix the mess that is Notre Dame football. 1. Hire a good coach – The Fighting Irish just checked off this item by snaring Cincinnati’s Brian Kelly. Some people will tell you that Kelly is unproven at the major college level. Those people are correct. They’re also missing the point. It’s the age-old problem: How do you get a job without experience and how can you get experience without a job? Every great employee got a first job somewhere. Mark Ochal at the Marion Star hired a high school kid with zero experience to write about Swamp Fox football in the Fall of 1993. That guy (me) is now an award-winning writer who blogs for money. The point is, Brian Kelly started at Grand Valley State in 1991 and, 12 years later, left with 118 wins and a pair of Division II national titles. He then went to Central Michigan and turned a crap job in the Mid American Conference into a decent one with a 19-16 record in three seasons. 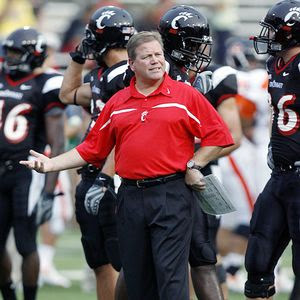 The Bearcats took a chance on him, let him coach (and win) a bowl game in 2006 and he added 33 more wins to a ledger that, when he packed his bags for South Bend, read 34-6. He won back-to-back titles in the Big East and coached Cincinnati to consecutive BCS bowl berths. That’s high-water stuff for Cincinnati, a team that was playing – and losing – games in Conference USA a few years ago. So, if he can make chicken salad out of chicken, well, you know, imagine what he can do with a nice piece of ground beef like Notre Dame? 2. Join the Big 10 – Once upon a time, it was trendy to be an independent. Florida State, Penn State, Miami, Boston College, South Carolina and Pittsburgh all spent more than a decade free from a conference for football. Most of those schools saw the benefit of joining a league in the early 90s, but while Notre Dame has joined the Big East for most of its other sports, the Fighting Irish has continued to stay out of a league for football. The argument was that Notre Dame can negotiate its own TV deal and with its long term deal with NBC, it gets network TV exposure. But now, with the rise of cable and satellite TV, is Notre Dame really on TV much more than, say, Cincinnati? Or Northwestern? And honestly, when I’m surfing the tube on a Saturday afternoon looking for a game, I often forget to check NBC. When Notre Dame football is your only in to the college game, Irish fans will watch. But casual viewers tend to hang around channels that routinely feature games. To me, joining the Big 10 is a slam dunk. The Big 10, which currently has 11 teams, by the way, needs a 12th for a money-making conference championship game. The Irish could use a schedule bump, which might help it attract some better talent. It’s a good match. Even joing the Big East would be an improvement. 3. Be honest – Notre Dame has to make a decision. Does it want to be Florida, or does it want to be Stanford. Of course, there’s a middle ground, but the question remains. Notre Dame has tough admission requirements, the type that some kids have trouble meeting. If you’re somewhat limited by geography (Indiana doesn’t match up well with California or Florida for weather and, uh, scenery for the average 18-year-old male) and recent history (Notre Dame hasn’t been a national championship contender in a long time), adding academic rigidity to the list seems to trend more towards the Stanford model. I’m not saying the Notre Dame needs to become, say, Alabama, but if the Irish alumni are going to keep demanding 10-win seasons and BCS bowls out of their coaches, you’re going to need to relax the criteria a bit. We’ll see if the golden domers decide to follow it. It’s not a particularly important goal, but Maynor Figueroa’s 61-yard strike for Wigan against Stoke was just plain awesome. Check it out on the soccer blog. I’m way late on this, but it’s been crazy in my non-soccer world lately. As I’m sure you’ve heard, the World Cup Draw was Friday in Cape Town, and it produced some very interesting results. Right after you heard about the draw, you no doubt caught the fact that the United States landed in the same group with England and, lo and behold, they’re destined to meet in the first group game. Well, at least it won’t be boring. The only other time these two teams met at a World Cup, the U.S. won a shocking 1-0 victory over the mighty English in Brazil. The score wasn’t reported here in the States right away, because the folks at the A.P. were sure that the 1-0 scoreline they heard couldn’t possibly be the correct one. Now, I’m not suggesting that the Americans are on the same level as the Three Lions. In fact, I dare say that on a neutral field, England would probably win seven or eight out of 10 matches with the U.S.
Of course, we aren’t playing 10 matches. We’re only playing one. We’ll have time to break this one down before June 12, but I’m not ready to put three points up in the English column just yet. I never thought someone thousands of miles away reading the word “Slovenia” would elicit a fist pump from me, but that’s exactly what happened during the draw on Friday. Now any team that dismisses Russia from the World Cup stage isn’t one to be taken lightly, but I’d much rather see them in Group C with the U.S., England and Algeria than some of the other Pot 4 choices, like Portugal or France. Algeria also had an impressive playoff win in Cairo against the African champions, Egypt. So, I’m not disrespecting them, either. Anything less than a berth in the knockout stages from this group has to go down as a disappointment for the red, white and blue. Hands down, it’s Group G.
Brazil, Ivory Coast and Portugal share a group with North Korea in what’s easily the most deadly group of four. Welcome back to the World Cup, North Korea. The two teams that escape from that mess will be battle tested, for sure. Group D, featuring Germany, Australia, Serbia and Ghana, is also very tough, while I’ll have to say that Spain got the easiest draw with the Swiss, Honduras and Chile joining them in Group H.
Mexico has a plum draw as well, opening the tournament with the hosts and then following with France and Uruguay. A host nation has never failed to escape group play, which bodes well for South Africa. Of course, the fact that Bafana Bafana is horrid should be of some concern to the natives. In June, the weather here and in Europe will be wonderful. In South Africa, it will be winter. That means it will be somewhere between 45 and 64 degrees. Cape Town also averages about 3.5 inches of rain during the month of June. Who does that favor? England, Denmark, Holland, Switzerland and the U.S., to name a few. With its third coach in as many seasons, it would have been easy for Terry Sanford’s soccer team to settle for a transitional year. CJ Komons and Rocket Court were having none of that. For their efforts, the first-year coach and senior forward are our picks for Coach and Player of the Year. That “something special” turned into an 18-win season and a third-round push into the State-4A Playoffs. But it wouldn’t have been possible without Court. The senior striker pounded home 30 goals and added 13 assists to pace the Bulldog attack. His efforts, along with three other first-team all-region choices in the defensive third— Scottie Custer, Zack Adkins and Scott Plummer — kept Terry Sanford playing soccer deep into November. And the importance of good rear guard isn’t lost on Court. Rocket Court, Terry Sanford, Sr., Fwd — Led all county players, public and private, in goals with 30 while adding 13 assists. He was Mid-South Conference Player of the Year as well as an all-region and all-state selection by the North Carolina Soccer Coaches Association. Jack Ward, Fayetteville Academy, Sr., Fwd — Ward had 26 goals and 10 assists for the Eagles in 2009. He was an all-conference, all-region and all-state choice by both the NCSCA and the North Carolina Independent Schools Athletic Association. Walther Mejia, Hoke County, Sr., Fwd — The Southeastern Conference Player of the Year scored 35 goals and added 13 assists for the Bucks. Mejia, the school’s all-time leading scorer, was also an all-region and all-state choice and scored both goals in the team’s 2-1 win over Pinecrest this season, which snapped the Patriots’ 67-game conference winning streak. Troy Beckham, Cape Fear, Jr., Mid — Beckham led the county public schools with assists with 16. He also scored three goals en route to earning all-conference and all-region honors. Thomas Goulden, Pinecrest, Sr., Mid — Goulden anchored the Patriot midfield with nine goals and 10 assists. He was also an all-conference and all-region pick. Luke Paul, Jack Britt, Sr., Mid — Paul had nine goals and 11 assists for the Buccaneers in addition to his solid defensive work. He was an all-conference and all-region pick. 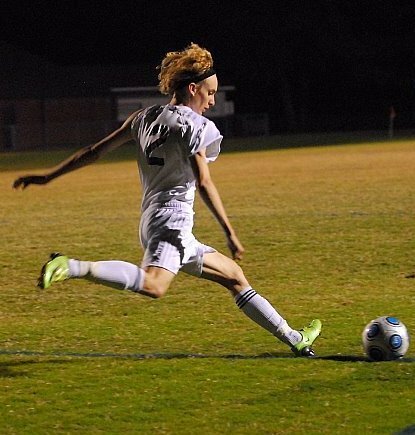 Nowell Worley, Fayetteville Christian, Sr., M/F — Worley piled up 17 goals and 17 assists while playing up top and in the midfield for the Warriors. He was an all-conference and all-region choice. Zack Adkins, Terry Sanford, Sr., Def — Adkins had a goal and three assists from the Bulldog back line on his way to earning all-region recognition. Terin Ellis, Fayetteville Christian, Sr., Def — Ellis scored 13 goals and had six assists while spending most of his time at center back. He went on to earn all-conference, all-region and all-state recognition. Scott Custer, Terry Sanford, Sr., Def — Custer had three goals and six assists while anchoring the Terry Sanford defense. He also earned all-conference and all-region honors. Scott Plummer, Terry Sanford, Sr., GK — Plummer had 11 shutouts in goal for the Bulldogs en route to earning all-conference and all-region honors. Ricky Lee, Cape Fear, Sr., F — Scored 19 goals despite missing a significant amount of the conference schedule with an injury. Lee added three goals and was a second-team all-conference and an all-region choice. Max Brenner, Pinecrest, Sr., Fwd — Brenner had 17 goals and seven assists for the Patriots en route to earning all-conference and all-region honors. Robby Jones, South View, Sr., Fwd — Scored 17 goals and five assists, accounting for 22 of the Tigers’ 29 goals in 2009. He was also an all-conference and all-region selection. Matt Legette, Gray’s Creek, Soph., M/F — Legette led the Bears with 14 goals and eight assists. He was also an all-conference selection. Daniel Vestal, Village Christian, Sr., M/F — Vestal scored 16 goals and had nine assists for the Knights. 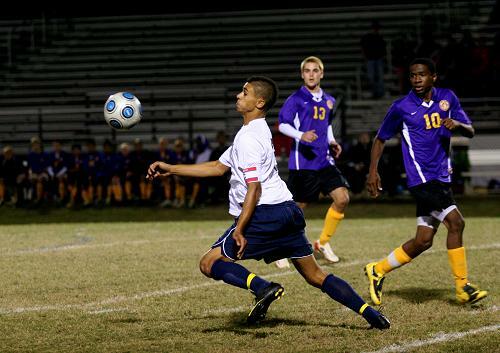 Justin Lopes, Terry Sanford, Jr., Mid – Lopes had four goals and 13 assists for Terry Sanford this season. He also earned all-conference and all-region honors. Chris Ryan, Pine Forest, Sr., Mid — Ryan had 13 goals and three assists for the Trojans en route to winning all-conference and all-region recognition. Joseph Latham, Hoke County, Jr., Def — Latham had four goals and 15 assists while anchoring the back line for the Bucks. He was also an all-conference and all-region selection. Ross Carroll, Jack Britt, Jr., Def — Carroll was a key part of a stingy Buccaneer defense while earning all-conference and all-region recognition. Carter Creech, Jack Britt, Soph., Def — Creech had two goals and four assists while playing in Britt’s back line. He was an all-conference and all-region selection in 2009. Sam Williams, Fayetteville Academy, Sr., GK — Williams was an all-conference and all-region selection who posted 11 shutouts in 2009. Tyson Balaam, Village Christian, Fwd, Sr.
Kelvin Jordan, Jack Britt, Fwd, Sr.
Balyn Krout, Scotland County, Mid, Jr.
Stephen Nalls, Gray’s Creek, Mid, Soph. Artan Rama, Douglas Byrd, Mid, Soph. Aaron Stroker, Pinecrest, Mid, Sr.
Manny Quiroz, Seventy-First, Fwd, Fr. The 2009 Fayetteville Observer All-Area team will hit newstands tomorrow. Of course, faithful readers of this blog can see it at 12:01 a.m. Thursday morning, when it will magically appear in this space. Thanks to all of the coaches who sent in nominations. It means a lot to get your input in the selection of this team.